Michael Sutherland is a small and medium enterprise business banker at Sagicor Bank. Armed with a Bachelor of Science and a Master of Science degree in business administration, specialising in finance, from Northern Caribbean University (NCU), Sutherland has been successful in his professional pursuit for the past two years. Priding himself on being a top performer, he has already achieved the status of team member of the month and for the quarter. But he was not always known as Michael Sutherland. For the first 17 years of his life, he actually went by the name Carl Collins. He shared his life-changing journey with Outlook . Sutherland grew up as an orphan, knowing nothing of his identity. He spent his baby days at Blossom Gardens, and by the time he was two, he was transferred to what would become his foundation, the SOS Children’s Village in Barry Town, Stony Hill, where he remained until he was 23 years old. He was given the name Carl Collins by SOS, with the date of birth: January 16, 1983. He remembers his formative years of being carefree, doing his schoolwork, going home from school and cleaning his shoes for the next day. Primarily sponsored by overseas partners with some government support through the Child Development Agency, he explained that the village adopted a holistic approach to family care, making education it’s focus. “In my time, there were 13 houses. Each house has a house mother and an aunt in residence. And while resources were basic and limited, we received three meals per day, we had annual sports days, spelling bee competitions and field trips. Partnership with the National Youth Service exposed those who were in high school to work experience over the summer holiday,” he revealed. They even gave him independent living at 16 years old and saw him through his years as an undergrad, until he was able to start his career. Aside from education, Sutherland shared that SOS also believed in discipline. And as far back as he could remember, he always displayed a great level of discipline – he has three consecutive years of winning ‘Child of the Year‘ to prove this. This innate trait, unearthed by the village, set his pathway for success. He was also an all-rounder at SOS, actively playing both tennis and football. 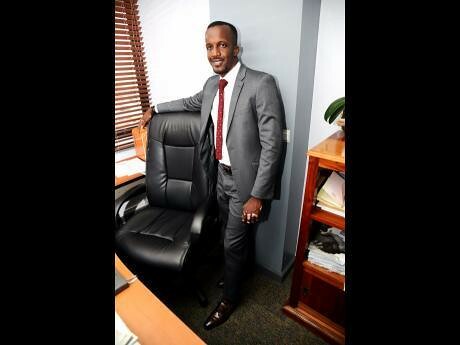 Transitioning from Jane Vera, owned by the home, to William Knibb Memorial High School, he was sidetracked by sports, so he attended Montego Bay Community College, where he attained an associate degree in management. NCU became his home away from home for both his bachelors and masters degrees, and even provided tutorial opportunities to the young scholar, who was more than happy to help others. Sutherland developed a deep love for the game of tennis. What started out as a pastime, playing on asphalt, barefooted in the parking lot, transcended into something much more. Those in authority noticed the fascination and made attempts to reach out and get funds for a tennis court. He got the opportunity through SOS to learn the art of the sport through Rocky Club, under the leadership of Linval Grizzle. With that same connection, he received an offer to work at the Half Moon Hotel. He smiled as he recounted his time as a ‘ball boy’. When he was there, he not only met many celebrities, he was also afforded the chance to represent Jamaica on the world stage in lawn tennis. In 2002, as he geared up to play in the Telus Tennis Open in Vancouver, Canada, he made a startling discovery. Biological parents or family members would come to visit their offspring or relatives at the village, but those living there showed no real interest: for all they knew, their family had abandoned them and SOS was their real family. “My grandmother came to the village when I was 16 years old – she was the first person I met in my family. She would come by every now and then, but I never understood who she was, because I was young.”It wasn’t until he was making preparations to apply for his visa that it was revealed that he had not one but two birth certificates: one in the name of Carl Collins, registered by SOS, and the other, Michael Sutherland, recorded by his biological parents. In that moment, he had a choice to make. And he decided to return to his new-found roots, accepting his new name, new date of birth and new identity. The support he missed out on with his biological family, he gained from his second family, the Strongmans. The Strongmans, one of the international sponsors linked to SOS, saw potential in Sutherland and assisted him in any way they could. The strategic Sutherland took a brand new shirt that he got from someone, and traded it with one of his friends from the village, just for the chance to go to the Strongman’s home with him. While ironing in house nine, he officially met with them and dialogue transpired between both parties. Thoughts were expressed by Sutherland about participating in the tennis tournament in Canada. The Strongmans, who hosted children abroad annually, extended that courtesy to Sutherland, who they said showed promise. After performing well in the competition and seeing the finer side of life, he wrote the Strongmans a thank-you note, and there began their unique bond. A grateful Sutherlandshared that the Strongmans would go on to help with his scholastic pursuits, and even play an active role in job quests – he could not thank them enough for their guidance and support. Sutherland worked with the National Commercial Bank for close to seven years before moving to Sagicor, a switch he deemed as strategic, as he believes in relationship banking and felt this was a better fit for his growth and development. Since then, he has received the Business Banker of the Year for 2017 at the Sagicor Awards and has applied for the leadership programme, where he was successful. But his proudest moment to date: being a motivational speaker to Canadian diplomats and representing SOS in the process.